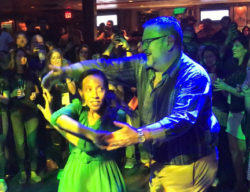 Image description: Chris Trebatoski and Haben Girma dancing at the House of Blues in New Orleans. Chris and Haben are in the process of completing a dance move known as a wrap turn. Their fingertips are touching to guide the turn. Both are smiling and enjoying the dance.Post Text: At typical conference of lawyer conference cynicism is palpable. The typical legal tech conference is no different with the exception of frustration permeating the cynicism.Neither existed at the Clio Cloud Conference in New Orleans. I knew that would be the case before I even arrived. This was fourth time that I attended the conference presented by the Clio the software that I use to manage my law practice.Clio’s software has provided a platform for me to grow my firm and to provide a superior client experience to those that I provide legal services.This year positive energy was palpable. You see, the Clio team decided to redesign their platform from the ground up. The primary purpose of the redesign was to improve lawyer’s ability to deliver superior client service. Their mission “Transforming the Legal Profession, For Good.” To do that requires not only providing the best practice management tool for lawyers, but also the best platform from which lawyers can provide superior client experience. The software and integrations certainly provide both and will only become more powerful over time. The software is an amazing platform – the conference transforming. One reason I attend the conference every year is that my practice and my ability to provide legal services of the highest level depends upon discovery of the most innovative approaches available to solving problems. Every year I have found and implemented new and innovative solutions based upon presentations and keynotes from the Clio Cloud Conference. This year the solutions, inspiration and opportunities presented were so innovative and thought provoking that when I left the conference to return home I was exhausted mentally and physically. Exhausted but energized and inspired like never before. The most energizing and inspirational experience I had was one I could never have imagined possible. It began with the morning keynote speaker on the second day of the conference – Haben Girma. The first student to graduate from Harvard Law School who is both deaf and blind. She had the toughest speaking slot at the conference. The first speech on the second day after 1,200 lawyers had spent the night before partying in New Orleans. Her speech was the personification of transforming the legal profession, for good. Her life story is inspirational. Her style is humble and powerful. As Haben spoke of the importance of inclusion of those with disabilities, important as she demonstrated because of what society misses when inclusion does not occur, she showed us a video. A video of Haben dancing Salsa with two different partners. The video was extremely powerful for me. You see, my wife and I are competitive Salsa dancers. We finished third in the world in the over 40 competition for amateur-amateur choreographed showcase at the World Salsa Summit. What I saw in the video was Haben executing perfect salsa dance movement dancing with a partner free style – no choreography at all. For those who dance Salsa, that is difficult for someone who can both hear and see. Haben was magnificent without being able to either hear or see. Haben explained that she was able to dance because she could feel the rhythm of the music through the body movements of her partner and the step patterns based upon being able to feel the movement of the body position of her partner. Her description is precisely the way that the best dancers in the world dance. That evening the conference had a networking and celebration event at the House of Blues in New Orleans. My wife and I met and talked with Haben that evening. (The way one talks with Haben is to keyboard there portion of the conversation through a keyboard that is attached via blue tooth to a machine that coverts the keyboarding into braille. Haben responds verbally.) I told Haben about our dancing and started to ask her if she wanted to dance that night in the House of Blues. I could not even keyboard the entire question and she enthusiastically said yes. When we approached the dance floor, the entire floor stopped dancing and opened space on the floor. Every eye in the room was on us. The band even stopped for a moment to see what was happening. Haben and I danced three or four songs. I cannot tell you for sure because the dance was so enjoyable that I totally lost track of the time on the dance floor. I did not notice at all that Haben was either blind or deaf. Rather, the connection and experience through the dance was just that the connection of two people in the experience of dance. I did notice a change in me. Almost immediately when we started to dance. The weakest part of dance for me is movement in my upper body. For those who have not danced Latin dance, whether it be Salsa, Bachata or Cha Cha, it is may be hard to understand but the upper body movement in the dance is as important as the touch of hands in a lead, the body position in a turn pattern or the footwork involved in the dance. Communication of rhythm and timing of the dance to Haben had to come from upper body movement because that is where the connection would begin. As we danced, I noticed my upper body moved better than it had ever moved before. I am certain that without the experience of dancing with Haben and the understanding of connection and communication originating in both of our bodies I would never have been able to in an instant improve the weakest part of my dancing ability. The improvement was so noticeable that my teachers and coaches could see the change in the first practice/lesson after I returned. In those dances, that night at the House of Blues in New Orleans, I learned just how much we miss if we do not include all human beings regardless of ability or disability. I learned dance movement that I struggled with for years in a few moments on the dance floor with Haben. That is a moment, an experience, I will never forget. My wife and I will be dancing in competition at the Canada Salsa and Bachata Congress in Toronto this weekend. I will be dancing with a part of Haben with me at every dance. My life will be better and forever changed. Transformation for good. That’s something we can all do – now. What a lovely article! I was at the Clio Conference in NOLA and captured a small video clip of the two of you dancing. Utterly captivating and inspiring! Feel free to get in touch, if you would like a copy of the clip.